Apologies for the unimaginative title but I have a headache. My remedy for the headache was of course pie. As a Pierateer, more unusual fillings catch my eye and this was no different for the steak and red onion pie I had for lunch today. I looked over the traditional 'steak and ale' and 'chicken and mushroom' and settled on this £2 (or 2 for £3 offer which I greedily took up) pie. Though cooked for the recommended time, the pie was a little bit burnt on the outside but cold in the middle. However, I think this flaw is very much the fault of my oven rather than the pie. 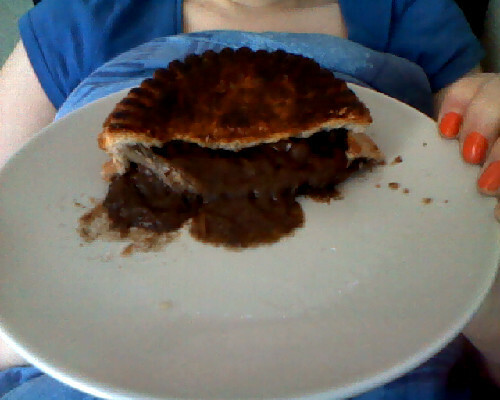 After a quick blast in the microwave to get it hot, the pie turned out to be very tasty. The steak pieces were soft and easy to eat rather than chewy. The gravy was thick and flavourful. The red onion in the pie made a lovely change from the regular white onion, which is often used a a cheap filler in regular pies. The subtle change made the pie a bit sweeter than you might expect but this is really nice. Overall, the pie was not really exciting, but made a fabulous cheap lunch treat. High praise indeed when the pie looks so burnt. Time to invest in a new oven?